CROWN HEIGHTS, N.Y. (WABC) -- Carey Gabay, the aide to Governor Andrew Cuomo who was shot in the head during a pre-dawn party before the annual West Indian Day Parade in Brooklyn, died in the hospital on Wednesday. His family confirmed that he was removed from the respirator Wednesday evening. Gabay's family had announced in a statement Wednesday that their loved one had been declared brain dead on Tuesday. "We are saddened to announce that after an arduous week, Carey Gabay, our husband, son, brother, uncle and friend, has been declared brain dead as of late Tuesday," the statement read. "There are difficult decisions we will face in the coming hours and days as our family struggles to process what this means for us. We ask that our privacy be respected during this difficult time." The NYPD is now using facial recognition software to try to track down the gunman, who police believe is a local gang member. 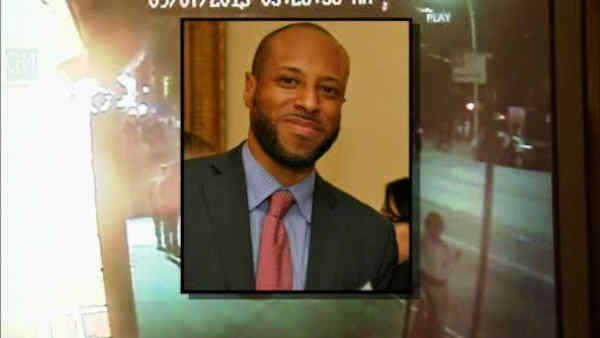 Authorities say he opened fire at a rival among hundreds who were peacefully enjoying the festivities, striking the 43-year-old first deputy counsel to the governor at about 3:47 a.m.
"We are all incredibly saddened by the news from Carey Gabay's family," Gov. Cuomo said in a statement. "I ask that all New Yorkers please join me in keeping both Carey and his family in their thoughts and prayers during this difficult time." The suspect is described as a black man in his late teens or early 20s who was wearing a white T-shirt and black pants. He had a beard and was draped in a Jamaican flag. Detectives have collected more than 300 videos from the scene. "We are saddened to announce that after an arduous week, Carey Gabay, our husband, son, brother, uncle and friend, has been declared brain dead as of late Tuesday," the statement read. "There are difficult decisions we will face in the coming hours and days as our family struggles to process what this means for us. We ask that our privacy be respected during this difficult time. "Many have come to know Carey through professional life, but he is also a kind-hearted and selfless soul who has touched the spirit of everyone he's met. His zest for life speaks volumes. "Carey has been fighting bravely surrounded by the loved ones to whom he has brought so much joy with his jovial nature, generosity of spirit and enduring smile. "Our family is grieving that a man in the prime of his life who has impacted so many lives could be struck down by such a callous act. Carey embodies the American story. A son of Jamaican immigrants, he rose from Bronx public housing to earn an undergraduate and law degree from Harvard and then went on to a distinguished career as a lawyer in private practice and well-respected public servant. "This is a nightmare that's shaken our resolve and tested our faith. As we continue to try to make sense of this tragedy, the family would like to extend its thanks to all those who have supported us. We also extend a special word of thanks to the doctors and staff at Kings County Hospital Center. "We ask that anyone who may have information related to the criminal case contact law enforcement as they conduct their investigation. "We will continue to burn a flame for Carey with the same tenacious yet tender spirit that has guided him."